Toward a Secret Sky by New York Times bestselling author Heather Maclean is a fast-paced thriller that mixes reality with possibility, blending an epic romance with a breathless flight through the highlands of Scotland, the secret city under London, and history itself. The Seven Money Types by Tommy Brown helps you discover how God has wired you to naturally think about, feel toward, and handle money. Understanding your money type helps you reduce internal tension, resolve conflict with others, and experience true financial well-being that goes beyond the bottom line. Reflect on God's love and mercy through the Lenten season with Devotions for Easter, a classic devotional that will help you prepare your heart to celebrate the resurrection. 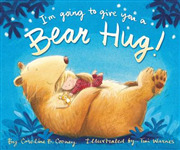 I'm Going to Give You a Bear Hug!, written by bestselling author Caroline B. Cooney, is a playful and comforting bedtime book that imagines all the wonderful ways a child might give and receive a hug.